Voices from beyond the grave: Chris McCormack makes contact with the spirit realm in Darkfield’s new installation. 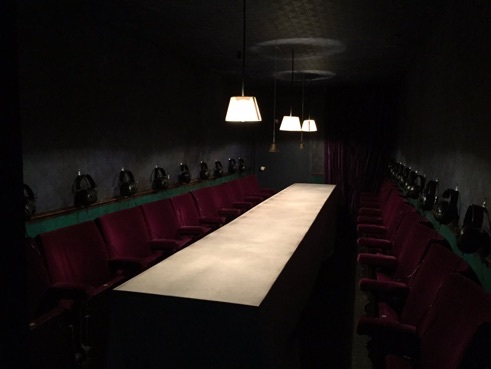 There are likelier places of worship than Darkfield’s surreal new installation, which, as its name suggests, offers a summoning of voices from beyond the grave. Ushered inside a white shipping container, with an abstract mannequin on its roof, we sit on velvet seats at a long table. Like every spiritual quest, you wonder what the message is going to be. Glen Neath and David Rosenberg’s absorbing production impressively takes place in complete darkness. Through headphones we hear an invisible preacher. The sound design could compel by itself, but, miraculously, there’s someone also performing before us, sending out vibrations as they nimbly pace the narrow cabin, dancing in the dark. Such is the genius of Darkfield’s sonics that you could believe you’re in a chamber full of would-be-believers. All around you, your neighbours seemingly give their names and lie like sacrifices upon an altar. But really, it’s a neat illusion. An epigram reminds us that even though we can’t see the table before us, it exists. These questions of belief soon segue into a piece of horror, as Neath and Rosenberg’s script insists on our fears. “You’re afraid, in your heart of hearts,” nudges the preacher. Despite a fresh approach to the genre, this all feels like it’s been done before. Surprise, surprise, the benign spirit summoned before us turns out to be a phantom lunatic! Our ears get chewed up as our surroundings warp and split apart. If the production itself hasn’t already blinded you, the obviousness of its developments might well do so. Neath and Rosenberg don’t go beyond the quotidian demands of the genre. So where does that leave us? It may very well be nothing more than an appreciation of anachronistic fashions and a good sound system. But planted assuredly at the front of Summerhall, it risks suggesting something more off-putting: a superficial side of the Fringe, fetishising contemporary devices for the sake of a blast of new technologies. Despite the production’s wealth of talent, the idea remains facile, and the unconverted unconvinced. Séance is on at Summerhall until 26th August. Click here for more details.